Here we list activities that are scheduled for the next month or two. Things could change frequently, so we are sorry if we're not always accurate. 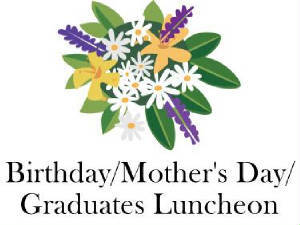 On May 13 we will have a combined Birthday/Mother’s Day/Graduates Luncheon. Brisket & chicken will be provided, but please bring side dishes and desserts.